Who May Have a Card? Anyone who meets any ONE of the following conditions: lives is Harnett County, lives in a contiguous county (Lee, Moore, Cumberland, Sampson, Johnston, Wake, or Chatham), attends school in Harnett County, owns property in Harnett County, works in Harnett County. Photo identification and something showing applicant's name and current mailing address must be presented. A current driver's license is usually sufficient. First time patrons are limited to two items at checkout. After the initial transaction, local DVD limits apply, and patrons can check out up to 99 total items. Any applicant under the age of 16 must be accompanied by a parent or guardian to receive a library card. 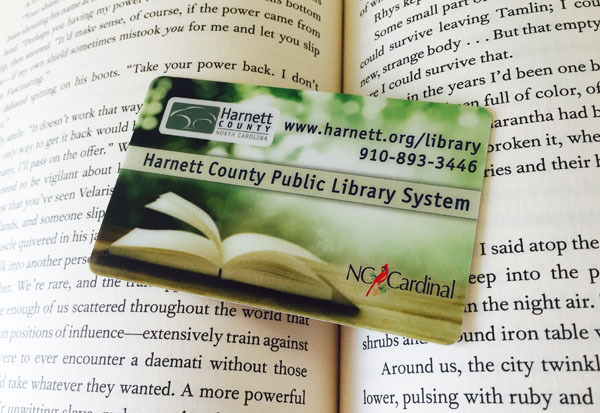 Please visit the FAQ page for more information about library cards, materials, and services.